When I go into a shop with a sweet tooth, more often than not I gravitate towards Skittles. But in Central America I have been disappointed over and over again: chocolate is often kept refrigerated, but Skittles are not. And every time I find them fused into a brick. Is there anything sadder than a solid bag of Skittles? Makes me want to cry just thinking about it. But on Utila, they have a great supermarket–Bush’s–that has count ’em five varieties of not melted Skittles. They move beneath my fingers like pearls. 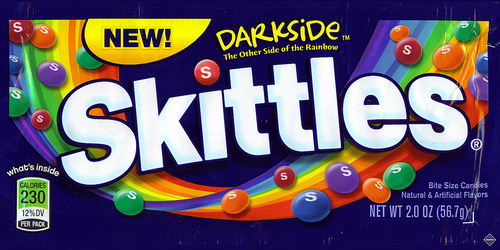 And they have a crazy limited edition flavor: “Dark Side”. What?! Be still my heart. This entry was posted in Food by ladyasatramp. Bookmark the permalink.